Click image to enlarge East side o f Crates Point, as seen from Columbia Gorge Discovery Center, Oregon. Image taken June 4, 2005. 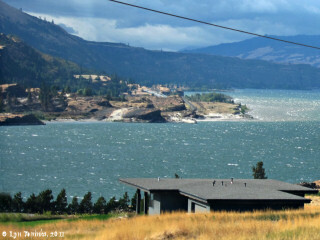 Crates Point, Oregon, is a high promontory located between Columbia River Mile (RM) 185 and 186, with Rocky Island being located another half mile upstream. 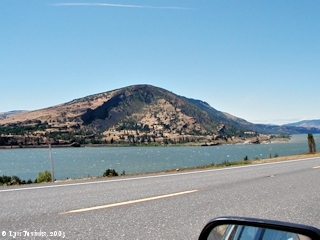 Crates Point marks the upper end of the Columbia River Gorge. 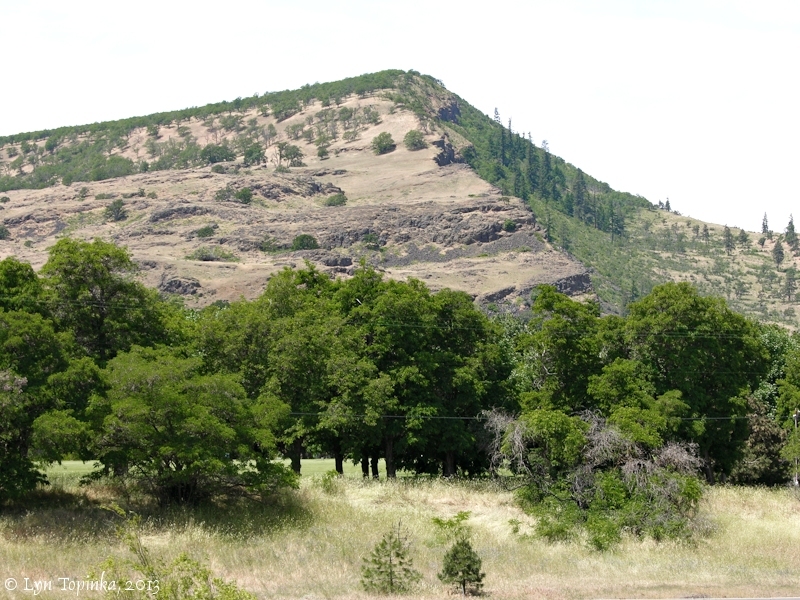 Upstream is The Dalles, Oregon, and downstream are the basalts of the Rowena Gap and Mayer State Park. Across the Columbia on the Washington side is Dougs Beach State Park and nearby the small Washington community of Murdock. The Crates Point Light is located on Rocky Island at RM 186.5 and the mouth of Chenoweth Creek is located at RM 187. 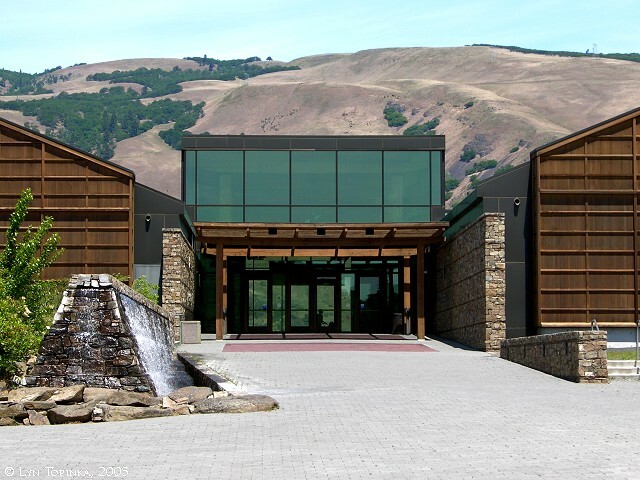 The Columbia Gorge Discovery Center is located on the east side of Crates Point. Squally Point is the downstream tip of the Crates Point promontory and is located at RM 185. A railroad station known as Crates is located near that point. 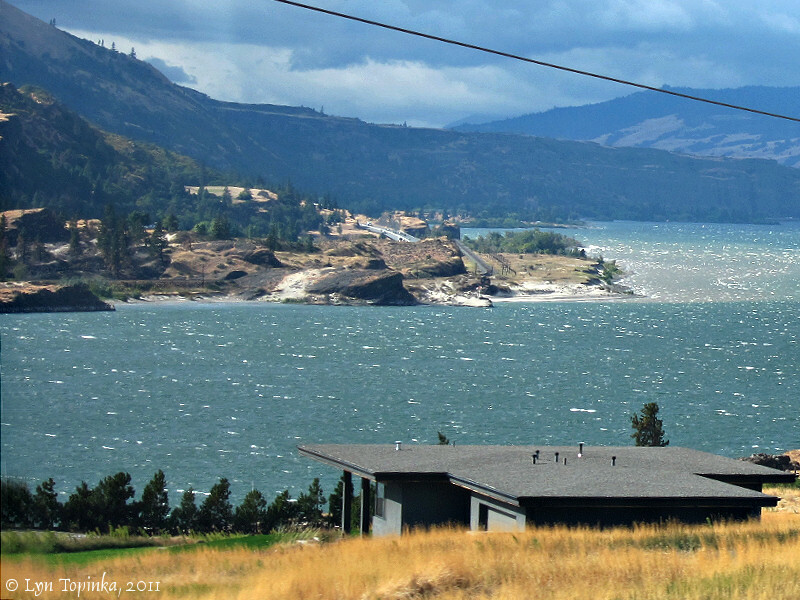 Click image to enlarge Squally Point, Columbia River tip of Crates Point, Oregon. View from moving car on Washington State Highway 14. Image taken October 6, 2011. Lewis and Clark spent the night of October 28, 1805, on today's Rocky Island on the east side Crates Point. Crates Point and the small community of Crates were named for Edward Crate, a French Canadian who came to Oregon in 1838 as an employee of the Hudson's Bay Company. Edward Crate settled in the area in 1850, and in 1851 filed a land claim (under the spelling "Crete") for the area of Crates Point, which he selected because it was adapted to landing boats. On an Oregon 1860 cadastral survey (tax survey) for T2N R13E the peak at Crates Point was depicted but not named. "Rocky Island" was depicted and named. On the 1865 cadastral survey, Edward Crate had 640.93 acres as Claim No.38 in the Crates Point area. The peak of Crates Point was not depicted and Rocky Island was depicted but not named. The U.S. Bureau of Land Management General Land Office (GLO) Records database shows an Edward Crete and Sophia Crete being issued a land title for 640.94 acres on January 16, 1882, for parts of T2N R13E Sections 16, 17, 20, and 21 (1850 Oregon-Donation Act). In a list of Indian names for localities near The Dalles, Doctor McKay gives Kat-ka Talth for the mountain at Crates Point. 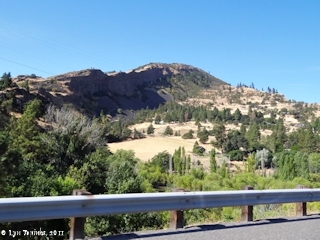 ..."
Click image to enlarge Crates Point, Oregon, As seen from Washington State Highway 14. Image taken July 5, 2003. Click image to enlarge North side of Crates Point as seen from Interstate 84, Oregon. View from moving car. Image taken September 28, 2011. Click image to enlarge Northern view, Crates Point, Oregon. 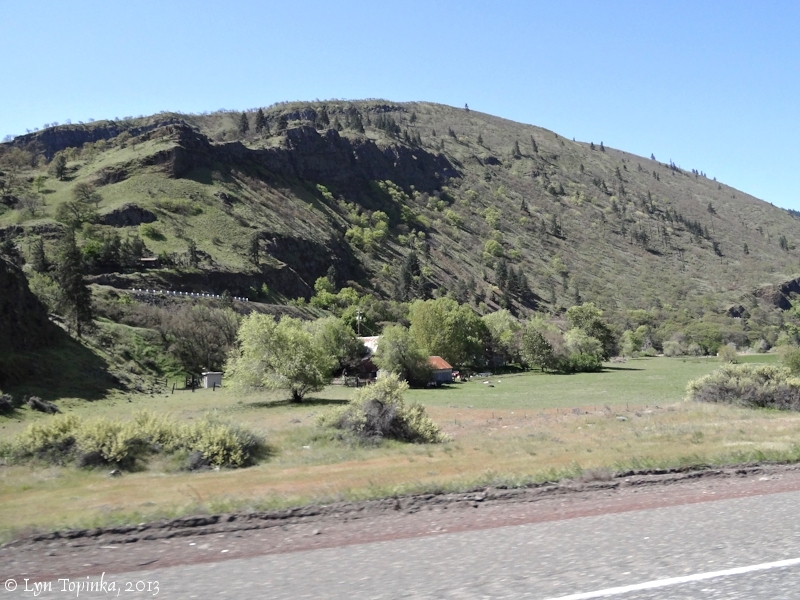 As seen from moving car on Interstate 84. Image taken April 22, 2013. 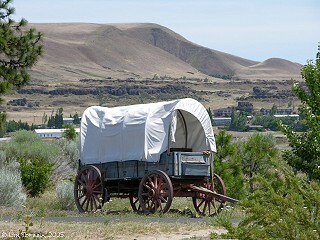 At the mouth of Chenoweth Creek near Crates Point, the Oregon Trail emigrants embarked on steamboats, rafts, or canoes for the 83-mile journey down the Columbia River to Fort Vancouver. "At Crates Point, a protected harbor at the mouth of Chenoweth Creek, the Oregon Trail pioneers put into the river. John McLoughlin, despite orders from his superiors, sent bateaux and food here to assist (and occasionally rescue) weary emigrants. Nearby were many pine trees to cut for building immense rafts that could hold up to six wagons. Writing in 1843, explorer John C. Fremont described them as "ark-like rafts, on which they had embarked their families and households, with their large wagons and other furniture, while their stock were driven along the shore."" 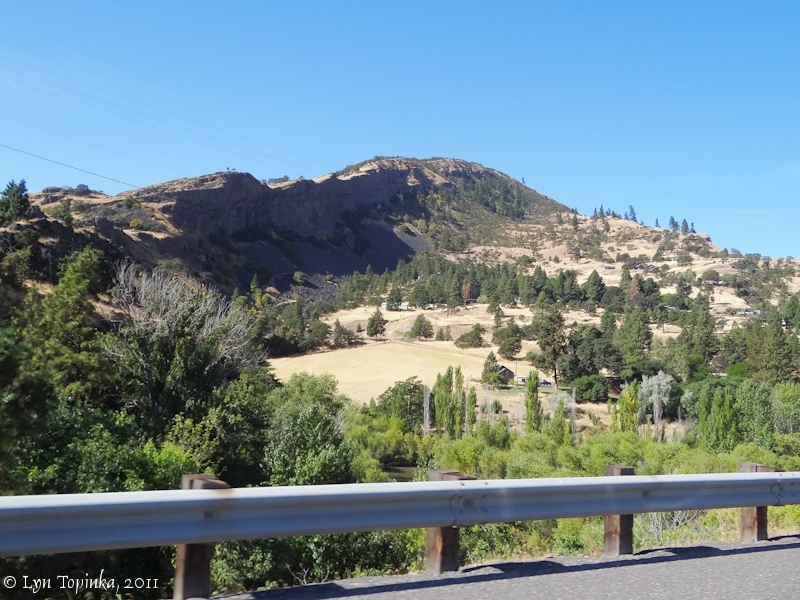 Source: Oregon-California Trails Association website, 2011, "The Dalles, Oregon, End of the Old Oregon Trail". 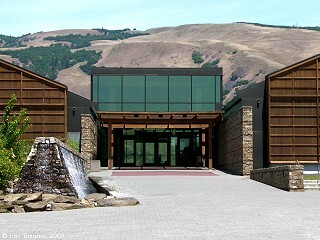 The Columbia Gorge Discovery Center is located at the east base of Crates Point.